with the minimum stress and the maximum confidence. Remember - Learning to drive doesn't need to be a nightmare! - just like Danny seen here proudly displaying her pass certificate. As a result currently around 80% of our new pupils come to us via recommendations from successful pupils. Why not join them and learn to drive with Eazidrive*? 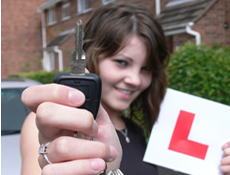 * Please note that to receive tuition as a learner driver your Eazidrive instructor will need to see both parts of your Provisional Licence.